Do you know that time when you are really craving something but you just don’t want to get up, go, and go get it? Yeah, it seems like I have been having those types of days lately. This past week I had a craving for this one, actually it was the craving for a Chicago style hot dog, but with french fries, and I was not about to get back in my car and head across town to go get them. 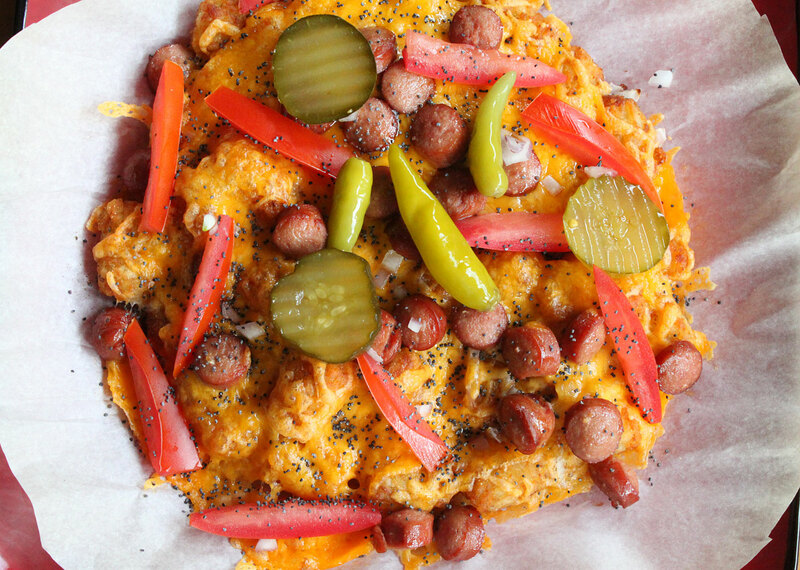 That’s when I took things into my own hands, rummaged through my freezer and refrigerator, and just like that I came up with the great idea of Chicago style hot dog tater tots. 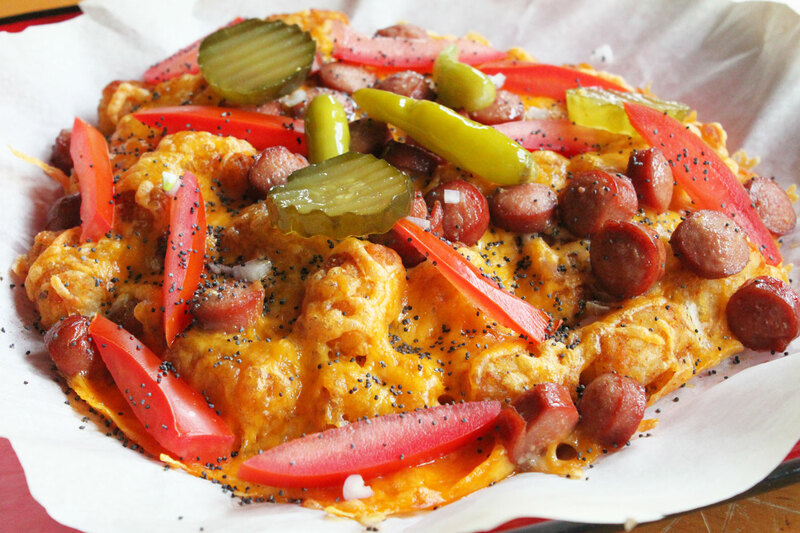 Sure, I’ve made pizza tots, bacon wrapped tots, and homemade tater tots to boot, but I’m not sure if anything compared to these Chicago style hot dog tater tots. It’s everything you love about a Chicago style hot dog, and fries, all in one delicious bite. If you want to use the funky neon green relish, by all means go for. That goes the same for yellow mustard, and as much as I love both of them, I omitted them from this particular recipe. Feel free to adjust these ingredients based on how many people you are going to feed. This one in particular could probably feed two, but I was really, really hungry at the time and decided to go all in. Start by lining a baking sheet with parchment paper, and preheat your oven to 425 degrees, or according to your instructions on your frozen tater tot bag. Line the baking sheet with as much, or as little tater tots to your desire. Cook the tater tots in the oven just until they begin to crisp up, about 15 minutes or so. During this time, either boil, steam, or microwave the hot dogs, just until cooked. After 15 minutes, remove the tater tots from the oven and add the onions to the top of the tots. Place back into the oven and cook an additional 5 minutes or so, just to lightly cook the onions. 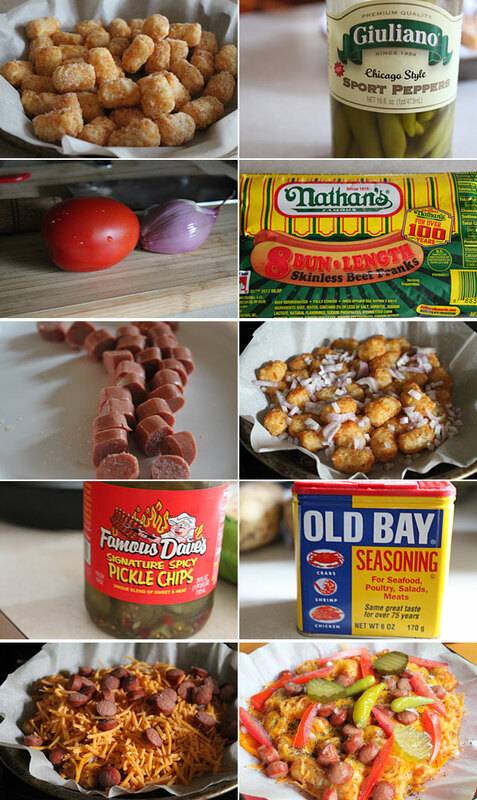 Remove the tots from the oven, coat them sprinkle on the celery salt and cajun seasoning (I use Old Bay for the additional celery salt factor), top with the cheese, and the hot dogs, and place them back into the oven until the cheese is fully melted. Once melted, remove, and top with the tomatoes, pickles, sport peppers, and shower everything with the poppy seeds. If you are wanting to use relish and mustard, by all means go for it. These things are way too good, and are sure to be a real crowd pleaser. Not only did I save myself from a trip across town, but I also won in satisfying my hunger and craving for a Chicago style hot dog, with tater tots! Hope you enjoy.